Questions, questions. And the content industry has struggled for answers, with most preferring to focus on the ‘how’ question over the ‘what.’ The ‘why’ doesn’t even get a look-in. ‘How’ usually leads us to ‘how do we stop piracy?’ or ‘how can we prevent people accessing infringing content?’ Our previously posed ‘what’ questions remain unanswered; our broader ‘whys’ left unspoken. Online piracy has been massively damaging commercial thorn in the content industry’s side for well over a decade now. In 2006, global audiences in developed regions were already starting to enjoy souped-up broadband speeds, with a subset of this audience quickly cottoning on to a world of free, unbridled access via P2P torrents. Direct downloads were being introduced to piracy audiences for the first time, preceding legal download services into the mainstream by several years. Fast-forward to 2016 and the industry is still struggling to answer many of the same questions. Personally, having such a great opportunity to speak with dozens of rights owners each year in North America, Europe, MENA and India, I can say the beat, generally, remains the same. Maybe the answers don’t matter. Piracy is a colossally damaging beast that should be stopped, rather than understood, granted. Industry bodies and commercial companies like Muso continue to work together to provide better, faster, more effective anti-piracy solutions to restrict the piracy market. Or maybe the answers are important – but how do we, as an industry, set about understanding the mechanics and various segments of a piracy industry benefiting from 78.5 billion website visits throughout 2015 for film and TV content specifically? Let’s get granular, and let’s get some transparency into the mix. Muso’s Global Film & TV Piracy Insight Report 2016 is released this month, so let’s start there. Headline stats: 78.5 billion visits to film and TV piracy content globally from January through to December last year. But a whopping 73% of this global piracy audience preferred to stream their infringing content. That’s more than 57 billion visits, three-quarters of the entire piracy audience. 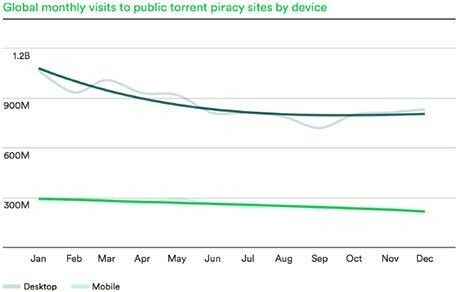 In the space of 10 years, the proportion of pirates using torrents has fallen from over 90% to below 20% (17.2%) in 2015. And in the space of that year alone, torrent usage fell by 18%. Piracy via mobile devices remains low globally, but is starting to show huge variation country to country. We’re seeing large incoming first-time piracy audiences choosing ‘ripper’ piracy sites as their delivery preference – these are platforms that simultaneously stream and download infringing content from user-generated content sites like YouTube. But highlighting an even greater segmentation across the total piracy audience is the data we’re seeing at country level. Piracy trend data is such a strong trend indicator. Piracy audiences are mostly early adopters across a broad range of demographics – millennials preferring to stream or download content, Gen X-er’s opting for a wider range of piracy delivery options – so we’re able to draw clear parallels between country-level piracy trends and local infrastructure, and the development of that specific content market. The trends and the behaviors we see are often repeated for legal content offers, or the launch of a new OTT service, for instance. 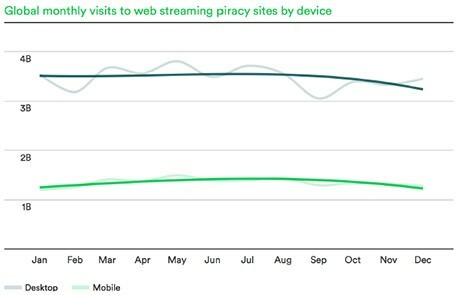 Piracy audiences are on their own journey, and figuring out global piracy trends helps rights owners’ best position themselves to engage and reconnect with them. Country-specific trends again provide more detail, and more direction. US Hispanic audiences? Only use web-streaming piracy. Torrent site visits? Still massive in parts of Europe. Is streaming piracy or download piracy emerging as a preference in less developed economies like India or parts of South America? It’s a mixed picture. Delivery method and country level trends are just the start but, ultimately, any successful strategy to affect the behaviour and ultimately meet the demands of this highly specific but fast-growing audience segment should lead from a highly focused approach.